The weather-wise are all a-Twitter over the prospect of snowfall in the Washington, DC region on Sunday, but the situation is giving forecasters fits. 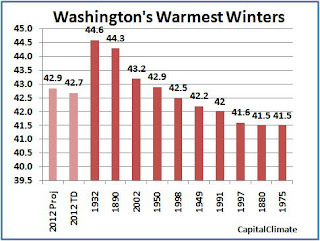 There's a good reason for that, since warm-February snows, while not impossible, are rare. 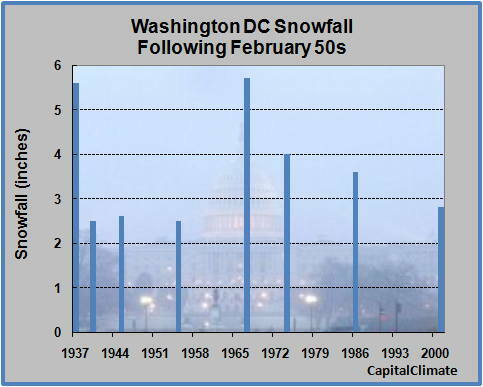 Since official records were kept at or near the current location at National Airport beginning in 1930, there have been only 8 instances in which 2" or more of snow fell in the calendar day following a day with temperatures of 50° or higher. With today's high of 54° and a similar reading expected tomorrow, there is a considerable climatological obstacle to overcome. 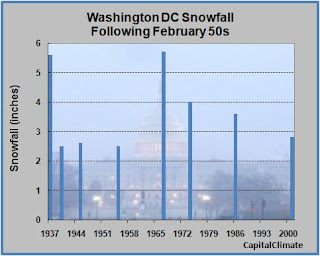 In fact, there have been only 5 cases in which a 2"+ snowfall followed a day with a high above 53°. The most recent instance of significant snow following 50°+ temperatures was on Feb. 22, 2001, when 2.8" of snow followed a previous day's high of 57°. That was preceded by a 3.6" snowfall on the same date in 1986, following a temperature of 56°. PM Update, February 14: With today's high of 56° and low of 37° exceeding the 24-hour forecast by 8° and 5° respectively, the winter average temperature to date is holding at 42.7°. 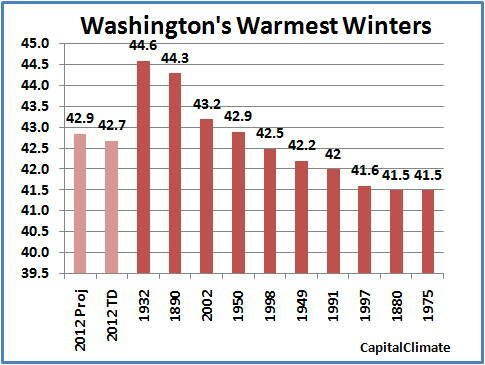 With a little over 2 weeks left in meteorological winter, Washington's current seasonal average temperature of 42.7° is now ahead of 1998 as the 5th warmest winter in records dating back to 1871. A projection of the final winter average based on the forecast temperatures for tomorrow through February 20 and climatological averages through the rest of the month would give a result of 42.5°, enough to still tie with 1998. If the temperature averages at least 3.7° above climatology for the 21st through the 29th, that would be enough to push the winter average to a tie with 1950 as the 4th warmest. Given that the month to date is averaging 4.6° above average so far, and the 8-14 day forecast indicates a nearly 50% chance of above-average temperatures (vs. a climatological expectation of 33%), this seems to be a feasible result.